So much for the account. Another result of the sermon was the vocation to the Franciscan Order of two young men in the audience, who were later beatified – Rizziero and Peregrin. When Rizziero received the holy habit it seemed that also the spirit of his seraphic Father had come upon him. He was inflamed with the love of God and zeal for souls, treasured holy poverty and practiced it to extremes. Together with consummate virtue Blessed Rizziero of Muccia manifested singular prudence, and for this reason, after several years of successful preaching he was appointed provincial for the March of Ancona by the holy Founder. But God did not exempt Rizziero from trials. Although he was an admirable director to others, he found himself entangled in a mesh of temptations that caused him great sorrow and confusion of mind. He prayed, fasted, and practiced severe penance, but all to no avail. He believed that he was rejected by God, that blessed Father Francis knew it, and for that reason did not love him anymore and consider him his son. The thought tortured him so terribly that one day he resolved to go to Assisi in order to learn whether it was really true. St Francis, who was lying seriously ill, was informed by God of the sad trail Rizziero was suffering and of his arrival in Assisi. He sent two of the brethren to meet him. They were to receive him in his name and greet him as one of Francis’ most beloved sons, and conduct him into his presence. The greeting brought great relief to Rizziero as he hastened to the bedside of the sick saint. St Francis rose from his couch, pressed Rizziero to his bosom, assured him again of his great affection for him, and made the Sign of the Cross on his forehead. At once Rizziero was transported, so to say, from hell up to heaven. 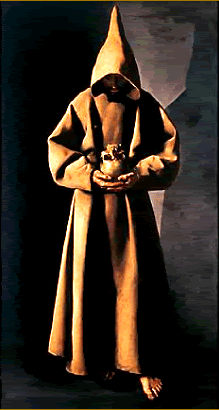 St Francis said to him: “This temptation, my son, has served very much to increase your merit; but in future you will be delivered from it.” St Francis kept Blessed Rizziero of Muccia close to him until his death soon afterwards. After the death of St Francis, Blessed Rizziero of Muccia lived another ten years in undisturbed peace of mind, steadily advancing in virtue. He died in his native town of Muccia, in 1236. Veneration of him began at once, and many sick people, especially those who suffered from fever, were restored to health through his intercession. Pope Gregory XVI approved the celebration of his feast.